The T-34 tank came as an unpleasant surprise to the Wehrmacht. It combined the protection of sloped armor with a fast and maneuverable suspension, and added a 76mm main gun that could handle anything the Germans had at that point. 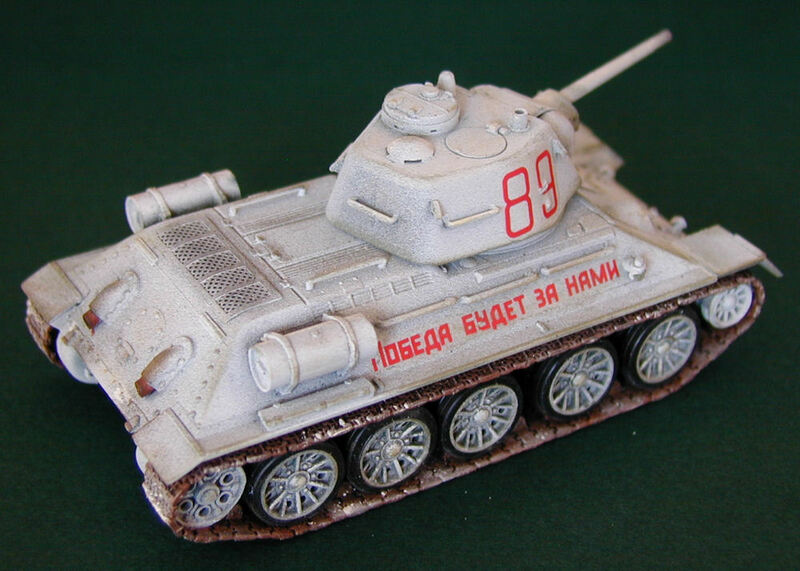 On top of that, the Soviets were able to commit the resources to produce incredible numbers of T-34s. 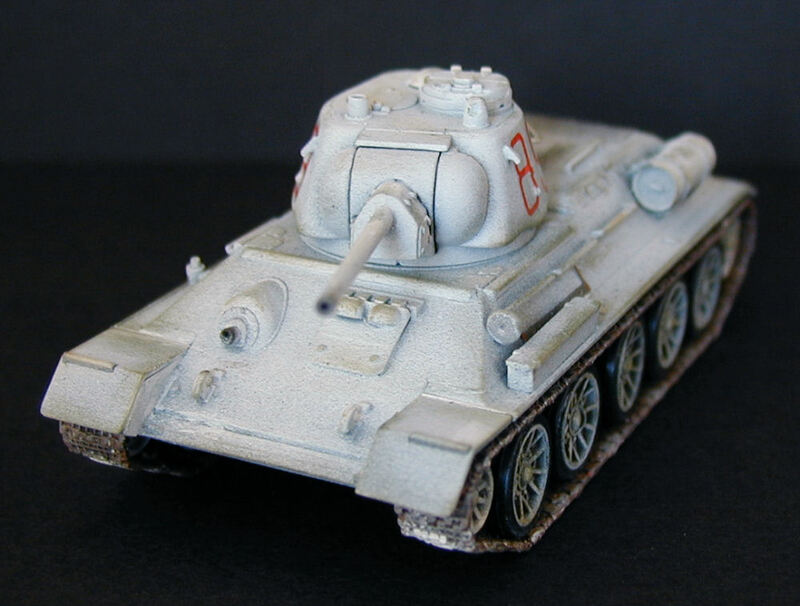 Of course, technology never stays static, and soon Germany was fielding new and modified designs, intended to counter the capabilities of the T-34. 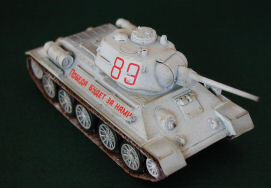 Soviet designers continuously improved the T-34, including using the hull as a basis for other vehicles and other armaments. 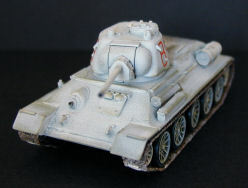 The OT-34/76 (1943) was a 76mm-armed T-34 of the 1943 pattern, but with the bow machine gun in the lower hull replaced with the ATO-41 flamethrower. The 1943 version included double the amount of flamethrower fuel. Flame tanks were used by most armies during the war, particularly when assaulting fortifications. Inside the usual blue UM end-opening box are the usual green UM sprues. Sprue A (2 copies) contains the wheels, track links, grab bars, auxiliary tanks, and a few other usually symmetric doodads. B has the lower hull and sides. 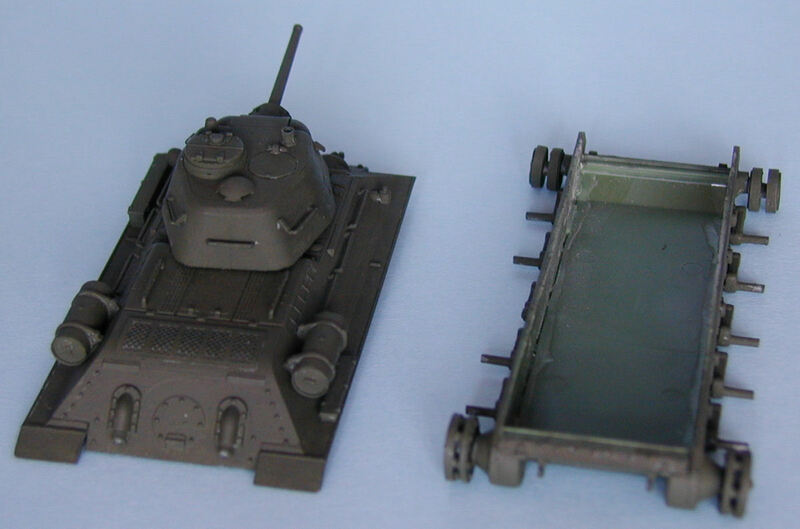 Together, these will look pretty familiar if you've seen any of the other UM T-34 or variant kits. Sprue C contains the upper hull and a few other detail parts, and E is the turret. Two copies of F contain all the vinyl tires for the road wheels and a couple of tow cables. Finally there is a small photoetched fret with three parts -- the engine compartment grill cover, a ring for the flame gun mounting in the hull, and the ubiquitous two-man wood saw. The standard 4-page instruction sheet includes a brief history in multiple languages and a parts layout with unused pieces shaded out. A small decal sheet completes the component list. As usual, there are a few extra decals not appearing in the provided marking schemes. Assembly begins with the lower hull, as well it should. With link-and-length tracks, it is generally easier to assemble them before adding the upper hull and fenders. In fact, it is quite possible to work on the upper and lower hulls simultaneously, which has the advantage of allowing work on one part to continue while the other waits for glue or paint to dry. 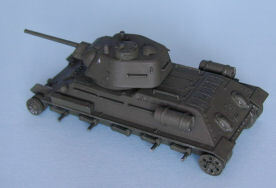 The turret is a third subassembly that can be worked on separately. The lower hull goes together simply, though you do need to be careful to get the nose and tail pieces right-side up. I like to have the upper hull handy at this stage, using a little quick dry-fitting to make sure everything is properly squared up. Next come the road wheel axles and front idlers. I assemble the rear sprockets, but don't glue them on until I'm working on the tracks so I can make sure I get them lined up right. Paint comes next, while I can still get in, between, and behind everything. Then the vinyl tires are added to the road wheels, which are then mounted on the axles. I've come to prefer link-and-length tracks, even in 1/72, and even though the newer "rubber-band" tracks from the likes of Dragon and Trumpeter have alleviated some of the old problems with attachment and paint adhesion. Still, link-and-length can be imposing until you've got a few sets under your belt. 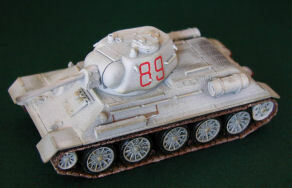 If you've never used them before, the UM T-34 kits just might be the best place to start. Take your time, do one side at a time, and pay close attention to the kit instructions, and you'll be surprised at how smoothly things go. After painting the tracks, in a multilayer treatment of metal, rust, and blackwash, I start by positioning the long bottom run, but without glue. I then start to glue the next sections on each end, which bridge from the bottom up to the front idler and rear sprocket. Only once I have these lined up and attached do I go back and run a little glue to fix the bottom run in place. Starting with the bottom means that I will finish up on top, where any unevenness in the final connections can end up in track sag (though less so with the T-34 than others) and eventually hidden by the fenders and upper hull. After the first couple of rear links are connected to the sprocket, I run a little liquid glue into the axle connection around back to fix the sprocket in place. Continuing around both ends with the individual links needed for the tighter curve, I finish up with the connection between the long top length and one of the shorter lengths next to it. A few minutes for the glue to set, and the other side quickly follows. Meanwhile, the upper hull has gathered just about all of its structural and detail parts and a coat of paint. This way, the remaining paint work once the upper and lower are united will be minimal, consisting mainly of touchup along the seams. The photoetched parts are worthy of note. While the saw and the flame gun mount need nothing but paint, the rear engine grille requires a partial curve. UM's brass is among the thickest I've ever seen, so, even if you normally don't bother, I have to recommend annealing the part. Heating the part in a candle flame -- get it to red-hot but without letting it burn up -- and then letting it cool will soften the part and make it possible to get a good curve of the rear half with a minimum of frustration. Finally, the top meets the bottom, and all that remains is some seam and paint touch-up. You can have your Soviet vehicle in any color you want, as long as it's green. Well, that's not exactly true, but it's the way to bet. There were some two-tone camouflages, and winter white schemes, but green predominates. Normally I use Vallejo's Russian Armor Green, but I like to introduce some variation, often simply by using different undercoats and keeping the green coat thinner. The instructions include two vehicles, the first is from the 47th Independent Flamethrower Regiment on the Baltic Front in Autumn, 1944, and is in overall green. The second is from the Leningrad Front in the Winter of 1944 in a white scheme. I chose the latter, which also includes a slogan, roughly translated as “Victory for Us”, painted on the right-hand side. 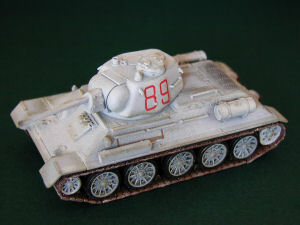 While I expect that there were some tanks which left the factory during the winter, already in white paint, most winter schemes were temporary field repaints, and not all that durable. That’s the look I was after. To that end, during construction, before mounting the tracks, I gave everything a coat of Russian Armor Green. I then sprayed a thin and uneven coat of white over everything, allowing some of the green to show through. The decals are some of the newer ones UM has been using. They are glossier and with less carrier surround than the earlier decals. They are nice and thin and handle well. Lastly, Tamiya Weathering Master pastels were used to finish off the look. All in all, an enjoyable and recommended build. The kit goes together quite well and appears quite accurate. Dimensionally it matches the specifications I have perfectly, and the shape matches the drawings and photos I have rather well, though I will admit that I am not an expert in Soviet armor. I love UM kits. While the moldings and engineering may not be quite up to state of the art, they are far better than what we usually call "short-run". They're pretty affordable, and cover subjects and variants that have rarely if ever been kitted in 1/72, and to a reasonable standard of accuracy. I particularly like the link-and-length tracks. 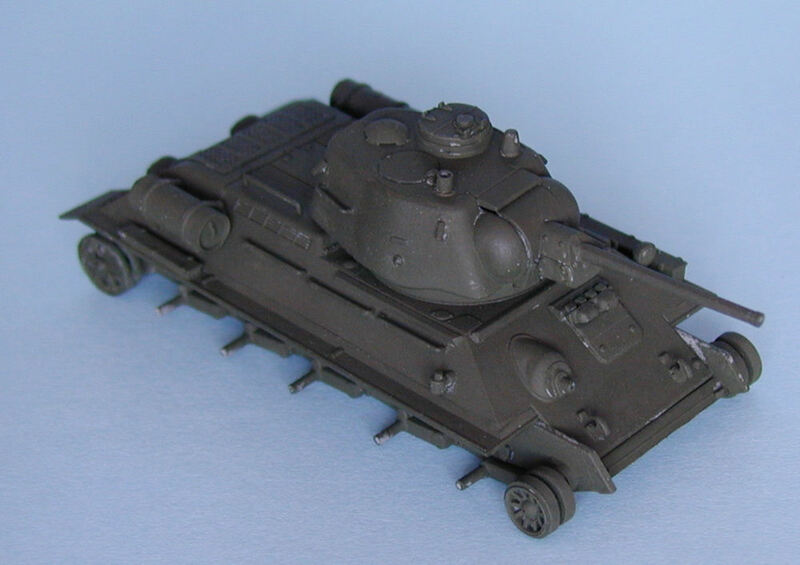 As I said above, if you've never built l-n-l tracks in this scale, and are a little hesitant, a UM T-34-hulled kit is probably the best place to start.